In the global stem cells market a sizeable proportion of companies are trying to garner investments from organizations based overseas. This is one of the strategies leveraged by them to grow their market share. Further, they are also forging partnerships with pharmaceutical organizations to up revenues. In addition, companies in the global stem cells market are pouring money into expansion through multidisciplinary and multi-sector collaboration for large scale production of high quality pluripotent and differentiated cells. The market, at present, is characterized by a diverse product portfolio, which is expected to up competition, and eventually growth in the market. Some of the key players operating in the global stem cells market are STEMCELL Technologies Inc., Astellas Pharma Inc., Cellular Engineering Technologies Inc., BioTime Inc., Takara Bio Inc., U.S. Stem Cell, Inc., BrainStorm Cell Therapeutics Inc., Cytori Therapeutics, Inc., Osiris Therapeutics, Inc., and Caladrius Biosciences, Inc.
As per a report by Transparency Market Research, the global market for stem cells is expected to register a healthy CAGR of 13.8% during the period from 2017 to 2025 to become worth US$270.5 bn by 2025. Depending upon the type of products, the global stem cell market can be divided into adult stem cells, human embryonic stem cells, induced pluripotent stem cells, etc. Of them, the segment of adult stem cells accounts for a leading share in the market. This is because of their ability to generate trillions of specialized cells which may lower the risks of rejection and repair tissue damage. 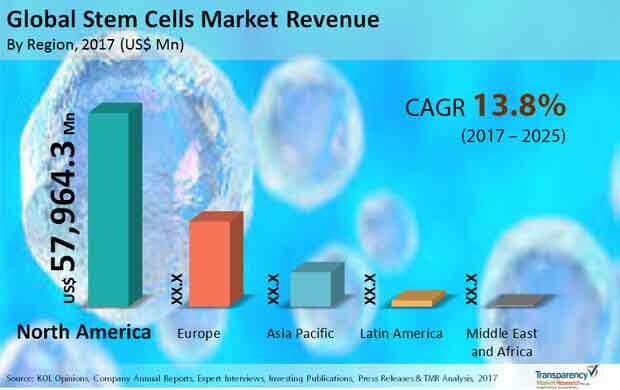 Depending upon geography, the key segments of the global stem cells market are North America, Latin America, Europe, Asia Pacific, and the Middle East and Africa. At present, North America dominates the market because of the substantial investments in the field, impressive economic growth, rising instances of target chronic diseases, and technological progress. As per the TMR report, the market in North America will likely retain its dominant share in the near future to become worth US$167.33 bn by 2025. Constant thrust on research to broaden the utility scope of associated products is at the forefront of driving growth in the global stem cells market. Such research projects have generated various possibilities of different clinical applications of these cells, to usher in new treatments for diseases. Since cellular therapies are considered the next major step in transforming healthcare, companies are expanding their cellular therapy portfolio to include a range of ailments such as Parkinson's disease, type 1 diabetes, spinal cord injury, Alzheimer's disease, etc. “The growing prevalence of chronic diseases and increasing investments of pharmaceutical and biopharmaceutical companies in stem cell research are the key driving factors for the stem cells therapeutics market. The growing number of stem cell donors, improved stem cell banking facilities, and increasing research and development are other crucial factors serving to propel the market,” explains the lead analyst of the report.